Part of the fun of any holiday is the preparation. When planning your canal boat holiday please allow plenty of time. It takes an average of 15 minutes per lock and 20 minutes to navigate a mile of canal. Time must be allowed for your pub lunch or a shopping expedition, exploring the local village church or any place of interest. 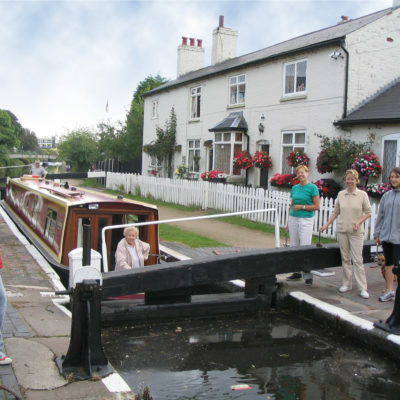 Most canals and waterways have frequent turning points (winding holes), water points and of course, canal-side pubs. All these are shown in detail on canal maps and guides which can be purchased from the Ashby Boat Company shop. Below are a number of the more popular routes, and information about them that we hope you find useful. 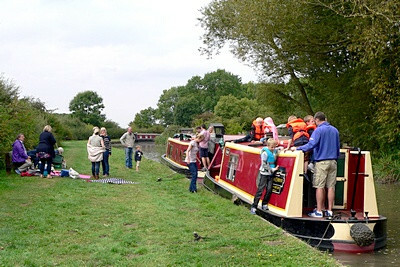 The most popular weekend trip is to cruise the lock free very pretty Ashby canal. 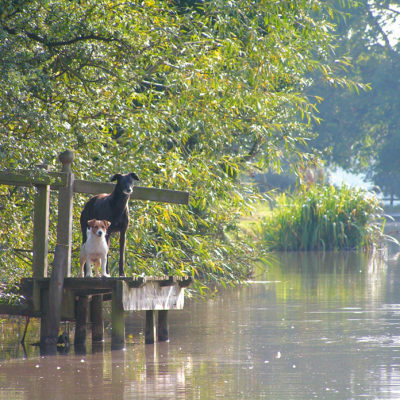 Cruising north from Stoke Golding you pass the villages of Dadlington (with the very popular Dog and Hedgehog pub Tel 01455 213151) After 1 hour you reach Sutton Cheney (turning point) with a canal side cafe and good walking access to the Battle of Bosworth centre (20 minutes walk). Shenton (with a steam train, glass blowing centre and a nearby antiques emporium, (turning point). After 2.5 hours you reach the pretty market town of Market Bosworth (turning point) with several restaurant options and a small co op supermarket. 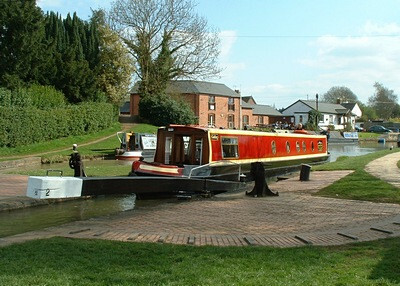 Congerstone is 3 hours cruise from Stoke Golding with a large pub (Horse and Jockey 01827 881220) only 800 yards from the canal Shackerstone village (turning point) (home of the battlefield railway and the Rising Sun pub Tel 01827 880215) is 4 hours cruise from Stoke Golding. The canals terminus is a further 2 hours cruise up to Snarestone (Globe pub 01530 272222) and through the 800 yard tunnel to the final turning point. If time allows you can extend you cruising hours by first travelling south on the Ashby canal to Marston junction (3 hours south of Stoke Golding). You may wish to cruise south onto the Coventry and North Oxford canals to reach one lock at Hawkesbury junction( Where the award winning “Greyhound pub sits just before the lock 02476 363046)Historic Coventry is only an hour and half away . Where you can visit the cathedral and transport museum (the largest display of British made transport in the world .Continuing south you reach three deep locks at Hillmorton (9 hours cruise from our base at Stoke Golding, near Rugby. 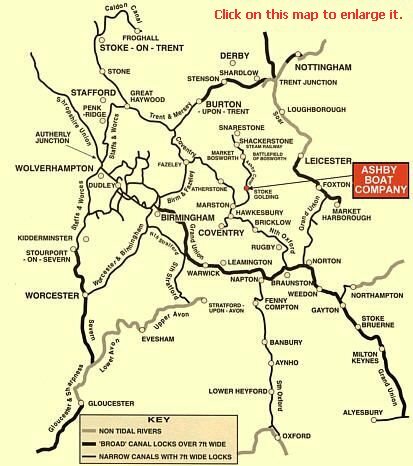 Glance at the canal map above and you will see that the Ashby Boat Company’s base is situated right at the very centre of the inland canal and waterways system. 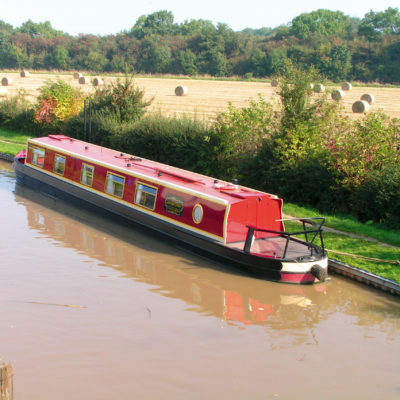 From here you have an excellent variety of cruising routes to steer your narrowboat along. There are many permutations of canal and waterway routes available from our yard and of course the distance traveled depends greatly on you. We only list here the more popular cruises for families and friends to undertake on their canal boat holiday. Cruising the “Ashby” The Ashby Canal is a tranquil 22 mile, lock free canal, ideal for first timers or people looking for a relaxing week, not requiring the “workout” that opening and shutting locks can provide. 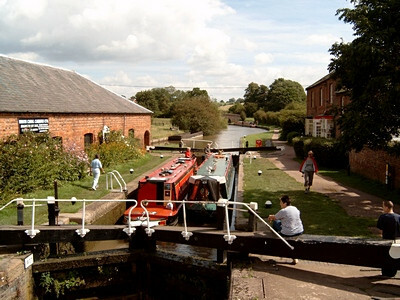 The picturesque waterway passes near Market Bosworth, you can explore Bosworth Battlefield ground and visit the Shackerstone Steam Railway amongst many other countryside attractions. Travel through the Snarestone tunnel and moor up at Snarestone. The Moira Furnace is a walk of approximately six miles from the (current) end of the canal at Snarestone, but you will be able to see the recent canal restoration, with only a small section remaining to be restored before access to the Moira Furnace is once again possible, the section from Moira Furnace to the Conkers visitor park already constructed. Find out more about The Ashby Canal. The broad stretches of the canal as it passes through Braunston. The Ashby Canal and North Oxford have a number of excellent public houses with superb food. The Greyhound at Hawkesbury, being just one fine example. On the way to Braunston you can divert five miles to the ‘Basin’ close to Coventry to visit the cathedral. Heading towards the spires of the church towards Braunston you travel through Rugby, an old market town, with the public school in the centre. This relaxing week takes you through only 4 locks. Progressing up the locks at the “Atherstone Flight” A fairly energetic circular route taking you through very beautiful countryside with a glimpse into the canals industrial past. This boating circuit is one of the more popular routes for our hirers. A recent television series focused on the many delights and interesting historical landmarks to be found on the heart of England’s canals. The castle town of Warwick with all its antiquated beauty as well as the Victorian shopping extravaganza of Leamington Spa are to the south of the ring. 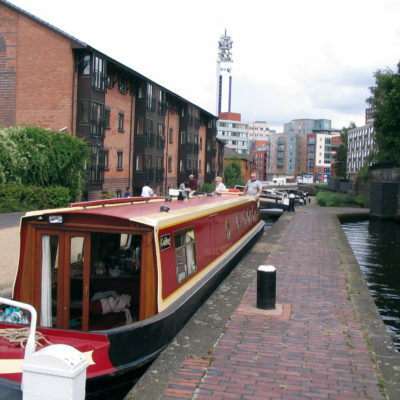 Further north are the award winning canals and development of Birmingham and Gas Street Basin after which you slip back into quiet countryside for the homeward journey. Coming down the locks to Napton Basin, the Windmill is up there somewhere. The Southern Oxford canal is a beautiful rural route. It meanders gently through mile upon mile of unspoiled countryside. After rising up the hill at Napton it passes through Fenny Compton, giving some breathtaking views of the Warwickshire countryside. 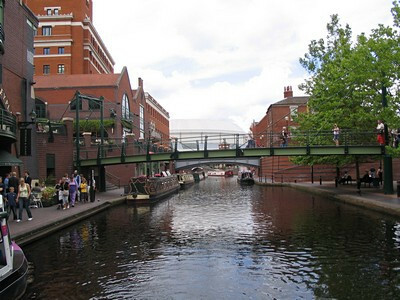 The canal then enters into the centre of the picturesque market town of Banbury. 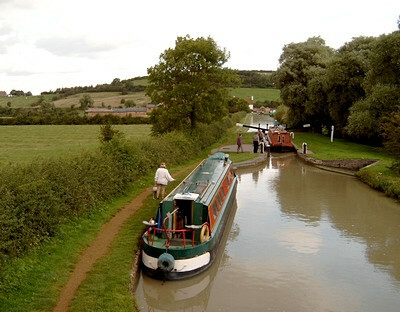 Meander South past Hawkesbury, Brinklow and Rugby and join the mighty Grand Union Canal with its wide locks and twisting tunnel at Braunston. Outward through Long Buckby to the almost 2 mile tunnel at Blisworth where you escape underground for 30 minutes (but not to worry, you can pass in the tunnels as they are 16 feet wide). Finally immerse yourself in waterways history at the enjoyable Stoke Bruerne Museum. This route includes several interesting canal junctions and passes some beautiful countryside near Cannock Chase. You may prefer to turn right at pretty Fradley Junction and travel along Brindley’s Trent and Mersey. Given two weeks, a whole variety of circular and out and return trips become possible. 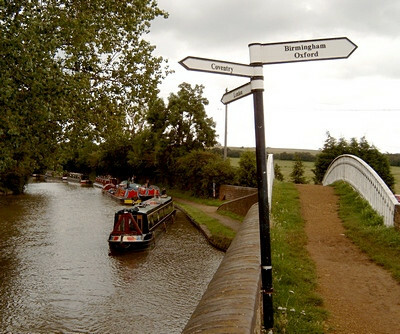 The Leicestershire Loop which encompasses the River Soar, Trent & Mersey and Coventry offers a particularly attractive mix of river and canal cruising. The varied route with 5 tunnels, several aqueducts even allows time for a couple of brief detours along stretches of other waterways. Two week return trips could also include destinations as far as Oxford, Nottingham, Stratford-Upon-Avon or the splendid Caldon Canal.